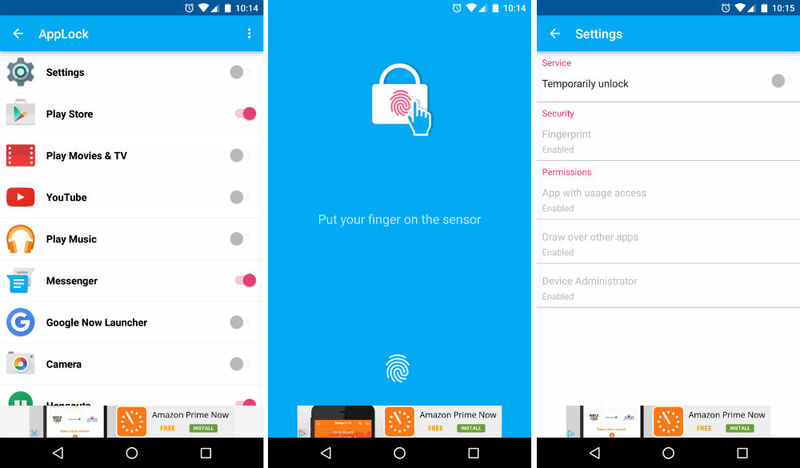 If you are looking to bolster the security on your Android device, and have a device that features Nexus Imprint (Nexus 5X and Nexus 6P), you can utilize AppLock, an app that will place a fingerprint barrier between the outside world and your precious data. When installed and enabled, users can go through their entire list of applications on a device, and then choose which apps will be secured using Nexus Imprint. For example, if you want Hangouts, Facebook and Instagram secured, simply enable only those apps. When enabled, and you attempt to open these apps, you will be met by a simple, blue lockscreen. To unlock, place your finger on the fingerprint reader to gain access. This allows you, and only you, to access these applications. If you plan on using the apps often, and don’t feel like unlocking them each time, you can place a temporary unlock on all apps, meaning the lockscreen won’t pop up each time you open them. Overall, if you have sensitive data on your phone, this app is a great way to help secure that data even if your usual lockscreen is somehow bypassed. The only downside I see at this time is the non-existence of an in-app purchase to remove the annoying banner ad you see inside of the app and on the lockscreen. It does not impede functionality, but it looks bad. In the future, we hope that the developer will either release a paid version with no ads, or will include an in-app purchase to remove them. Other than that, it works flawlessly for me. If you have a device that features Nexus Imprint, go check it out. Poll: Do You Use a Secure Lock Screen?